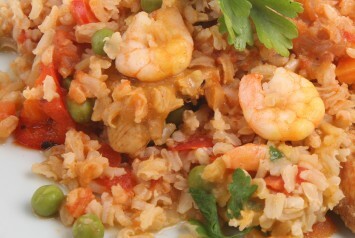 This is an easy to make and delicious Spanish rice recipe. It is one of those great and easy side dish recipes that really perks up a meal. Serve it with your favorite Mexican recipes, or with grilled or baked chicken or fish. Place the rice, stock or water, salt and turmeric in a fairly large pot. Bring to a boil and cook the rice, until the rice is about half done, about 8 to 10 minutes. Heat the oil in a skillet to a medium heat and add the onion. Cook, stirring well, for about 4 minutes. Add the tomatoes, salt, pepper, sugar and chopped peppers. Stir together then pour it into the pot with the rice. Continue cooking the rice for another 8 to 10 minutes, lid on the pot, until it is fully cooked. Just before the rice is ready, add the peas and shrimp. Cook for another few minutes to cook the shrimp and heat the peas through. At the last moment, add in the chopped parsley. Omit the shrimp and chicken stock for a fully vegetarian or vegan recipe. On the other hand, you can increase the amount of shrimp you add to 8 ounces if you, like me, love one pot meals. Just add a salad and dinner is done. You can also replace the shrimp with an equal amount of cooked chicken. To make this recipe even healthier, use brown rice instead of white rice. You will need to cook it longer. I would cook it 23 to 30 minutes instead of the 8 to 10 minutes called for in the recipe. That way, you can cook it again for another 10 minutes as per the recipe directions above and it should be fine. A pinch of sugar may seem odd but Italians and other nationalities often add just a tiny bit of sugar to recipes that use tomatoes, like this rice recipe or spaghetti sauce. It takes away any slight bit of bitterness the tomatoes may have. One of my favorite things to do with this recipe is to increase the amount of shrimp you use and make it a one pot meal. I just serve a salad with it and it becomes a really easy dinner recipe. 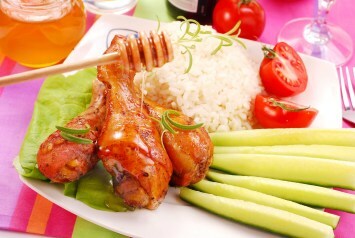 Spanish rice can also be made with chicken. I you have some leftover chicken, replace the shrimp with the cooked chicken. Easy dinner recipes are always about using what you have on hand whenever possible. Don’t like peas? Leave them out. To me, cooking is always about adjusting recipes to suit your own tastes. This wonderful Spanish rice recipe is a great side dish served with your favorite Mexican recipes.